Cyclists from all over the world now have the chance to secure their bicycles with a bicycle lock that combines the power of hardened steel with the latest fingerprint technology to create Grasp, the ultimate lock for your bike. The bicycle lock Grasp is made of the same hard material as some of most secure locks in the market, its hardened steel is covered by a soft plastic to not scratch your bike and it hosts the world’s smallest optical fingerprint sensor. Is this fingerprint sensor that will disallow anyone that’s not you from unlocking the Grasp and stealing up your bike, but the Gasp lock comes with an app for smartphones that lets you grant access to the locker to your family members. The app and Grasp sync with each another using Bluetooth connectivity, when you first open the app it will provide you with a special code to add your fingerprint. After that, you can add by up to 20 other members as recognized users. The gadget Grasp weighs approximately 1,35 kg, it resists to all weather conditions (resistible to temperatures reaching -20 °C) it gets powered by removable AAA batteries, these batteries are placed in a secure place within the device to avoid removal by thieves and they do not need to be replaced that often. A pack of three batteries can power the lock for up to a year. 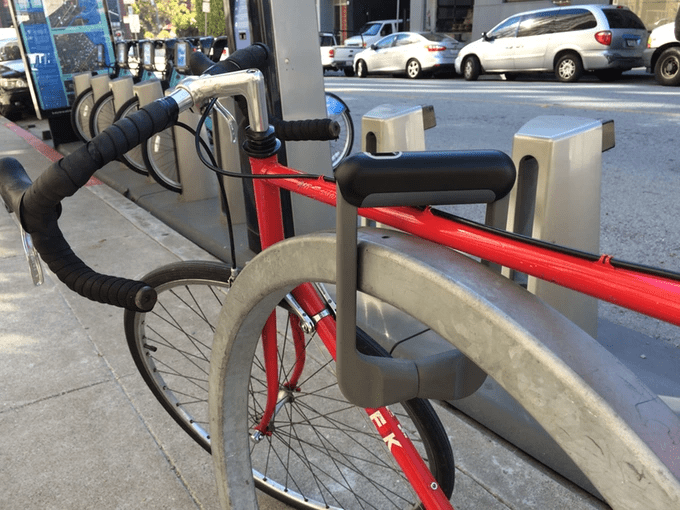 If you want to secure your bike with Grasp you can pre-order it for $120 from KickStarter where its makers are seeking for funds. Even that Grasp comes promoted as a hi-tech lock it really leaks some very useful features. For example, there’s no alarm notification in case someone is trying to cut the device or some unauthorized user is using the fingerprint sensor. As the device comes with an app, embedding an alarm within might be vital for the success of the lock. What do you think? Can Grasp secure your bike?